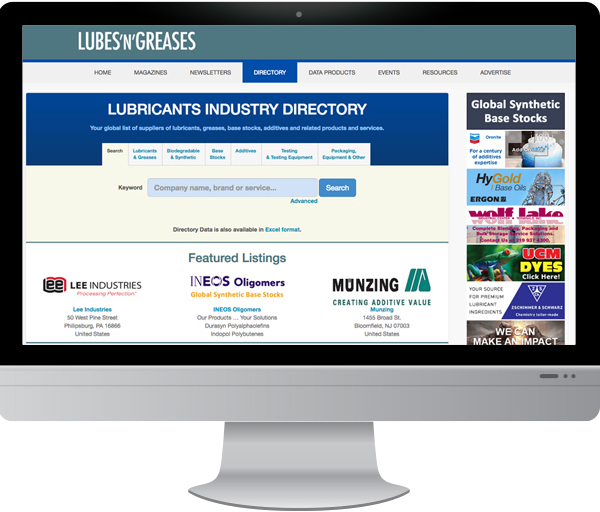 The Lubricants Industry Directory is a fully searchable, global online directory of product and service suppliers for the lubricants industry. Advertising is the best way to make your listing more prominent where customers are actively searching throughout the year. Advertisers’ listings appear above non-advertisers in alphabetical order when among search results. Seven ads appear on the right hand side of the home page in fixed positions. They also circulate among Run-of-Site ads. Seven fixed-position ads appear on the right hand side of search results when a user selects from numerous subcategories. Five random ads from the pool of ads circulating as Run-of-Site, appear to the right of the search results when users conduct a keyword search. Ads re-randomize as the user scrolls. Contact the advertising team for up-to-date metrics and availability.